Nice picture, but as usual the problem with many pictures taken in the Netherlands is that the lightness of the sky throws everything else into dark blob. I have taken many photos of Amsterdam city-scapes - and discarded most of them because of the lack of detail in the foreground or middle-distance. I often wish that I were a better photographer. I always wish I were a better photographer. In this case, I probably could get a better effect by going at midday instead of twilight. In any case, the damn cars obscure the canal side view. I am afraid that is not the one. 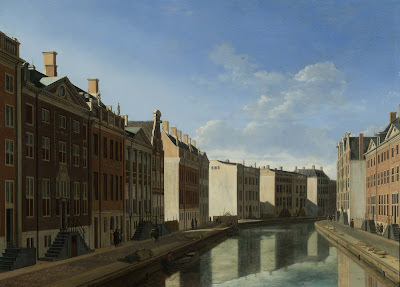 The Golden Bend is what you see when you are standing on the Vijzelgracht looking West. The Spiegelstraat starts on the Golden Bend. You on the other hand have a side canal going in that spot. "I often wish that I were a better photographer." 1) Aim well below the horizon and press your release button half-way. On the digital cameras I know this will trigger the light metering, but will not actually take a picture. While keeping the release button pressed half way, point your camera at your subject and then press the button all the way. 2) Modern cameras (2009 and later) have a so-called HDR mode (High Dynamic Range) that will solve your problem automatically by taking several exposures at once. I typically don't like the results, but tastes differ and it might be just your thing. Search Flickr for "HDR" and you will see what I mean. 3) Some digital cameras have a setting for temporarily under- or over-exposing your photos. On my Canon the button for this function looks like a square with a plus and a minus in it. Mine was looking west from Leidsestraat, so "a bridge too far."